Here is Some Information about Eklingji Temple in Udaipur Rajasthan India. Best time to visit: July to April. The magnificent architecture of Eklingnath Temple is simply remarkable. The double-storied temple looks awesome with its pyramidal style of roof and distinctly carved tower. The outer walls of the temple are stretched with steps that descend touching the serene waters. Inside the complex, the main temple is a huge pillared hall or 'mandap' that is sheltered by hefty pyramidal roof. On entering this hall, you will be welcomed by a silver image of Nandi. 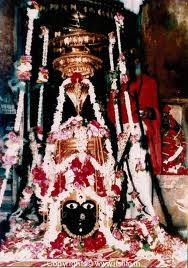 In the temple, there are two other images of Nandi carved in black stone and brass respectively. You would find this temple full of mesmerizing fragrance. The temple boasts of a striking four-faced idol of Eklingji (Lord Shiva) that is made out of black marble. Its height ranges around 50 feet and its four faces depict four forms of Lord Shiva. The east-facing part is recognized as Surya, the west-facing part is Lord Brahma, the north-facing part is Lord Vishnu and the south-facing part is Rudra i.e. Lord Shiva himself. The zenith of the multifaceted idol is known as 'Yantra that stands for the ultimate reality. The Shivlinga (Phallic form of Lord Shiva) garlanded by a silver snake, acquires the major attraction of people. Being sited in the middle, Shivlinga is encircled by Goddess Parvati, Lord Ganesha and Lord Kartikay. Inside the temple complex, you would find statues of Goddess Saraswati and Goddess Yamuna. The main temple also boasts of heavy silver doors, which depicts Lord Ganesha and Lord Kartikay guarding their father. To the north of Eklingji temple, there are two tanks namely Karz Kund and Tulsi Kund. Water of these tanks is consumed during the services of the Lord. The festival of Shivratri is observed here with full gusto and fervor. At this time, the image of Lord Shiva is adorned with jewelry. Enrooted in the religious roots, the town comprises around 108 small and big temples. Near to Eklingji Temple, you can also trace various temples that are dedicated to Ambika Mata, Kalki and Lord Ganesha. 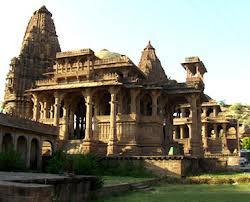 One more temple by the name of Nathon Ka Mandir that dates back to 10th century catches the attraction. Lakulish temple is a fine temple that was built in 971. It is the exclusive temple of the Lakulish sect in India. 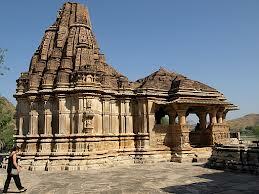 Sas- Bahu temple is another temple that is all raised in marble of the 11th century. The Jain Temple of Adbhudji is made in black marble which dates back to the 15th century. 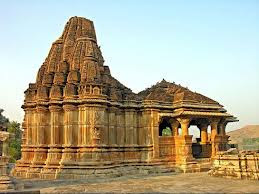 Amongst other temples of Kailashpuri (better known as Eklingji), temples of Pataleshwar Mahadeo, Arbada Mata, Rathasan Devi and Vindhyavasini Devi are worth mentioning. The wonderful architecture of these temples makes the onlooker to ponder over the artistry of those times. 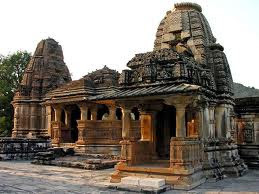 The city of Eklingji or Kailashpuri is located amidst a beautiful valley on the lands of Rajasthan that houses some of the marvelous temples of India. While planning your trip to Udaipur, don't forget to include Eklingji in your itinerary, otherwise you would be at a miss. One of the legends relating to Eklingji is that after killing Vrakshasur, Lord Indra had meditated and prayed to Eklingji in repentance and to be free of the curse. The Temple is very grand and magnificent in conception and perfect in execution. The 50 ft. high Shikhar of the temple has a circumference of 60 ft. The sanctum sanctorum has four doors in all the four directions and the door steps are jutted with gems. On each gate there is Nandi (bull) statue facing the idol. Nagada:At Nagada which is just 1 km before Eklingi, the antiquated temples are a special attraction for the pilgrims and devotees. 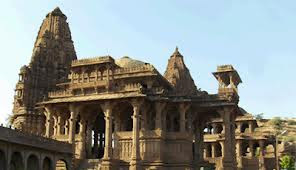 Some of the remarkable temple here at this place includes Adbhudji Jain Temple which is made of black marble dating back to the 11th century A.D. Another worth watching temple is the famous Saas-Bahu Temple which dates back to 9th century. Kumbhalgarh:Kumbhalgarh is a splendid fort with all its charms and fascinations intact to it. The Kumbhalgarh Fort and Kumbhalgarh Wildlife Sanctuary are the prime attractions here. Nathdwara:Nearby Udaipur there is the 18th century Krishna temple of Sri Nathji which is the main attraction in Nathdwara. It has a special significance for the Vaishnatives who are the followers of Vishnu and his incarnations. By Road : Udaipur is very well connected by road with various cities and towns of Rajasthan. By Rail :The Rail network here connects Udaipur with Delhi, Ahmedabad, Jaipur, Chittorgarh and all the major cities. By Air :The city has a domestic airport, serviced by almost all the major airlines from the main junction of Rajasthan around 22 kms from Udaipur is the National Highway No.8, where the temple is located. There are Local buses which travel from Udaipur to Eklingi temple every hour. Devotees can hire a bus or cab to arrive at the temple.